Welcome, and thank you for stopping by to learn more about our company's products and services. 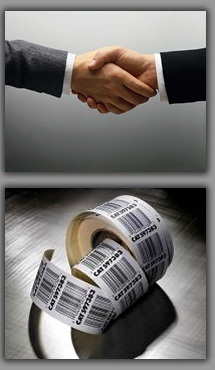 Barcode Label Consultants has produced for our clients cost effective, identification products, variable imaging that not only uniquely identify certain key components through the production process to increase company productivity. The use of data collection and identification products (i.e. labels, RFID tags and barcodes) not only uniquely identify key components as they provide for the speedy, precise distribution and evaluation of product information. We recognize the performance requirements that are required for your products as they are subjected to a myriad of applications and environments. We work with a number of hardware, software, and thermal ribbon producers to ensure your data collection runs flawlessly and effortlessly. Barcode Label Consultants is committed to its vision and quality of our products in order to continually achieve greater level of customer satisfaction. If you find significance in our business philosophy, and require products that increase your productivity for your business, contact us. We have state of the art production capabilities and provide unprecedented personal service. Additionally, we are experts with problem solving experience, and the knowledge to support your stringent requirements. Our aim is to continuously improve our performance, add value to our customers, while heightening the expectations of our clients through the achievement of the quality of our products, and timely cost effective service. Helping you achieve your vision is our passion. "Helping You Achieve Your Vision Is Our Passion"